What is a posinote ? 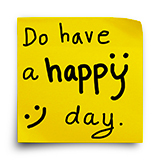 A posinote is a positive message written anonymously and free of charge on an adhesive note for someone else. By participating in this movement you become one of the links in a wave of compassion, joy and happiness around the world. An example will help you understand. You are sitting at a cafe. Before you go, write your positive message to the person who will come to sit in your place and you probably do not know. You “paste” it on the edge of the table (so as not to disturb the servers). The following person will discover with joy the positive message you have left him. Bravo! You just spread happiness! You can do this where you want. It’s a very simple and almost free way to participate in a very positive movement. Consult the page “concretely” to know how to participate. In order to avoid any abuse, please note that posinote © is a registered trademark.